KowCast Ep. 5 – AMC Preacher Episode 1 Reaction – Kow Cast! Your Kowabunga Comics Podcast. 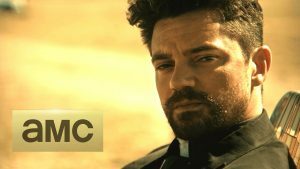 Eric and James sit down to talk about the newly released AMC Preacher premier episode. Hear our take on Jesse, Cassidy, Tulip and all the goings on in Angelville. Join in the discussion by sending us an email to podcast@kowabungacomics.com. You can follow us on Facebook @ www.facebook.com/incredicow, on Twitter @Incredicow or on the web at www.kowabungacomics.com.